The British Science Museum in London is well known throughout the world but perhaps little is really known about the individual gallery spaces it contains and what exhibits are on show. This page highlights some of the gallery spaces on the 2nd and 3rd floors of the museum and gives you a better understanding of just what you can during your visit to the Science Museum in London. If you like me love computers then you will find this gallery of great interest. It covers the history of computing from its early creation through to today's modern technology and the internet. Te gallery also looks at the people behind the machines and explores how computers have changed our world forever. cards which were used by many trades at the time. Babbage is now considered to be one of the most important pioneers of computing. Half of Babbage's brain along with some of his diaries can also be seen in the gallery for those of you who like to get to know the people behind the machines as well. The Pegasus (see picture above) - built in 1959. 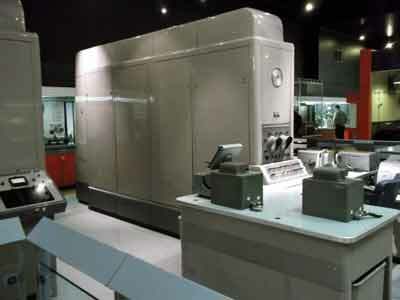 It is the oldest working computer in the world and is still run on a fortnightly basis. It was used to analyze scientific data and projects such as the design of the Sydney Opera house. Ernie 1956 - this machine was used to randomly pick numbers for premium bond winners. This is a small gallery which is all about a big issue, how we are going to fuel our world in the future. This gallery is aimed at 7 to 14 years olds and is an interactive space where you can explore different options for sourcing our energy needs in the future. One of the fun items which seemed to draw a crown was a tall spike like structure which is a artwork created by Christian Moeller. It has a big "Do Not Touch "sign on it which tempts you to touch it. If you do you will receive a mild electric shock and it makes a noise which sends everyone jumping for cover. It seemed to cause much amusement in the gallery. There are many things to touch and discover in this gallery including adding your own ideas for energy production to a giant energy ring which is suspended from the ceiling. This gallery is much more engaging than you may at first think; well Maths isn't actually everyone's cup of tea. But the way the gallery has been laid out and the exhibits displayed really sparks the interest, even in those of us who were never much good at math at school. The gallery covers many different aspect of maths and how it is used in nearly everything industry. Items such as early counting machines and guides to pantographs and slide rules. The video shows a few of the cases on display. This was an amazing gallery and was full of fantastic wooden model ships from throughout the ages. 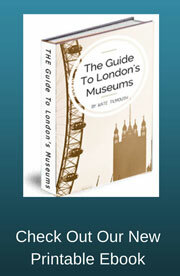 As well nautical instruments and a history of London docklands. There was so much to see here and every display cabinet demanded your attention. There is an example of nearly every type of vessel on display here from small one man coracles to Viking ships and everything in between. At the centre of the gallery is a beautiful figure head of a woman in a blue dress which came from HMS North Star. This gallery after 40 years has now been closed to make room for a new exhibition called the InformationAge which will open 2014. However the shipping gallery hasn't been lost forever. All the objects have been put into storage and the whole gallery has been digitally photographed into a 3D fly through model. This gallery is mainly aimed at 8 to 14 year olds but all are welcome to join in. It is the largest interactive gallery at the British science museum and is all about fun and education at the same time. Materials - What are the differences between materials etc. Energy Transfer - Discover that energy cannot be destroyed only transferred. Forces and Motion - How different objects move. Electricity and Magnetism - Discover these forces. Sound - What is sound and how is it made. The gallery is manned by staff that are there to help you understand and make the most of the gallery exhibits. There are also science shows throughout the day on the hour and so it is quite easy to spend quite a few hours alone in this particular gallery. It is one of the most popular areas of the museum especially with the families as it entertains and educates at the same time. Right next door to a super modern gallery in the British Science Museum like launchpad is a very different gallery which is full of scientific instruments from the 18th century. The 18th century was known as the period of Enlightenment due to the fact that this was when many scientific discoveries were made and was a time when new thinking and ideas emerged. Air pump by George Adams 1761.